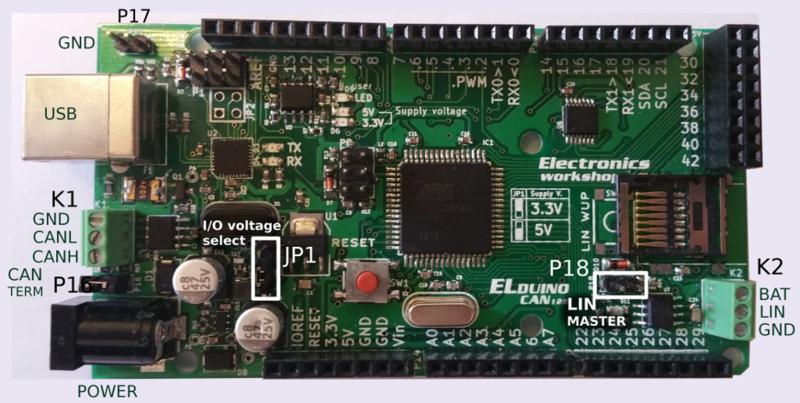 This is a short description of the connections on Elduino CAN128 board. K1 – Two wire CAN bus connector. P16 – Jumper connects the terminating resistor (120R) to the CAN bus. Do not mount it when you connect it to the car. K2 – LIN bus connector. Pin BAT has to be connected to +12V from external power supply. P18 – LIN bus master/slave selection. If mounted, Elduino board is master on the LIN bus. If taken off – it is a slave. P17 – two additional GROUND pins. For easy voltage/signal measurement with oscilloscope, multimeter or logic analyzer. JP1 – selects the microcontroller and board I/O voltage levels (3,3V or 5V). Please allways set it to 5V (two lower pins are shorted). Hi Vaidas, is it possible to change voltage level to 3.3v? why i'm asking, you mentioned that it should set to always to 5v. It is possible to change voltage level to 3,3V, however this puts microcontroller outside its specifications. The microcontroller is clocked at 16MHZ and according to the datasheet microcontroller should be powered from 5V with this clock frequency. I did not have problems running the microcontroller at 3,3V and 16MHZ, but it is not a reliable and recommended solution. Also, when running microcontroller at 3,3V you have to make sure that you do not connect 5V level signals to it.